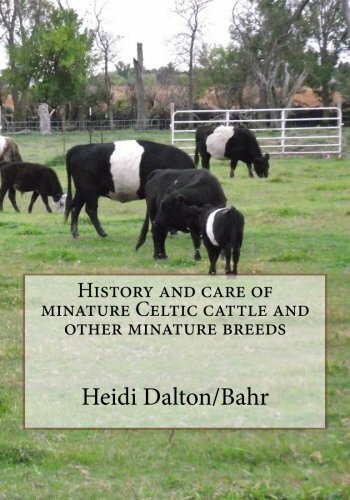 History of celtic cattle shows a time line on how Celtic cattle grew in size over time. Minature cattle breeds. How to buy,market and basic care of minature cattle. execellent information for the first time minature owner and expert alike. About the Author: I live in the eastern part of South Dakota on a mini ranch, founder of Celtic Cattle Company. My Husband and I raise Celtic cattle, Yaks and three oversized wolf dogs. I have three grown boys, 2 grandchildren and one on the way. I was born and raised in Utah where I met my Husband. I have lived in England, North Dakota, Nevada, and Montana. When my husband retired from the Air force we moved to his home town in South Dakota. I have been blessed with a very understanding husband and have been able to raise different types of livestock according to the area and amount of land we owned in the different places we have resided over the last 20 years. It is my greatest wish and hopes to see people raising their own livestock on an acre or two and not relying so much on genetically altered food from the super market. I can’t feed the world but I can feed my family and friends healthy home grown Beef. It starts here with one person, family, friends, community, town, city, State, the of chain events that in rich the lives around us.